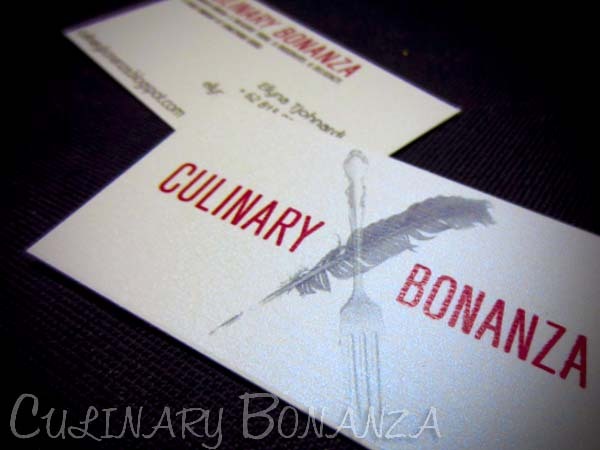 More than 370 days and 140 posts ago, Culinary Bonanza had first started sharing edible stories and experiences. As it receives more recognition among the netizens and readers, it is time to take things up a notch and in a more serious direction. I believe in the power of a business card. It is a symbol of something serious and official. It is the beginning of a relationship, a networking, a partnership and friendship. It is a symbol of one's commitment to stay true to his/her identity as stated on the card. The path to the final design was not smooth-sailing. I had bumped into blank and bleak nights when I just stared blankly on the computer screen, without any idea of what to put on the card or how the final design would look like. Choosing the right material was an equal headache. Alas, I'd like to thank my friends for their artistic inputs & opinions, that the business card finally looks as sleek as this now. I'm totally in love with it. From this day onwards, I will walk proud and tall, telling people that I am a blogger, a crafter of words and stories about man's classic indulgence and vital form of life sustenance: food.